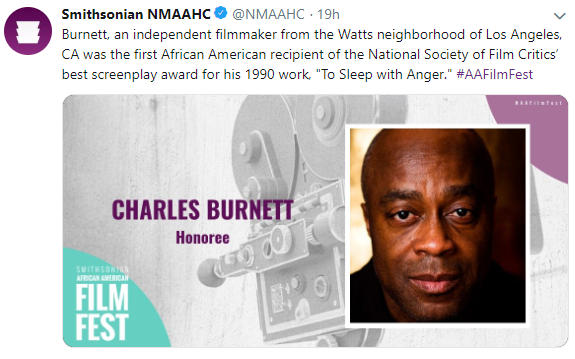 The Smithsonian African American Film Festival presented by the National Museum of African American History and Culture is underway. An inaugural event, the Festival is a unique four-day cinematic experience celebrating African American visual culture and film. The incomparable Quincy Jones stops by the Festival's red carpet at the screening of his documentary, Quincy. Stephan James, Kiki Layne and Regina King glowing on the red carpet at the screening of If Beale Street Could Talk. 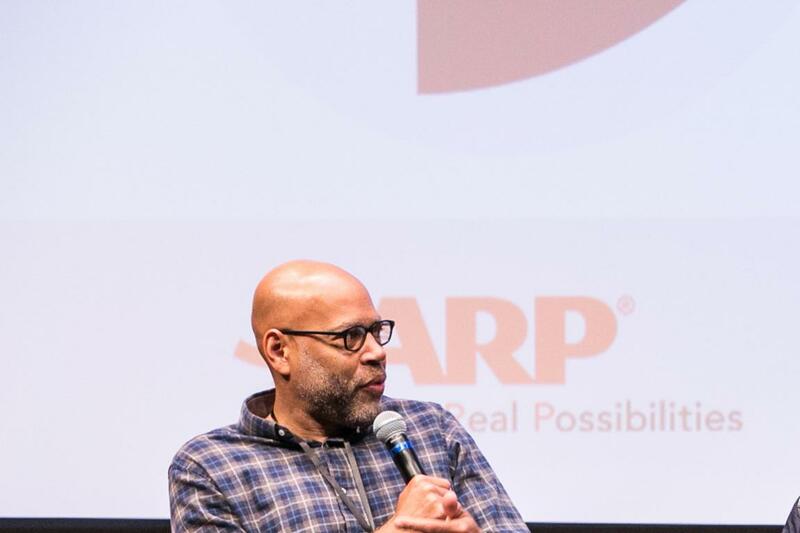 The Festival showcases historical and contemporary media works that encompass the African American experience in a setting designed to foster engagement among filmmakers, scholars, and the public. Featured films range from works within the Museum’s collections to “black classics,” and newly created films by emerging filmmakers. Post Screening Conversations immediately follow film screenings providing the opportunity to hear from the filmmakers, cast, and crew. 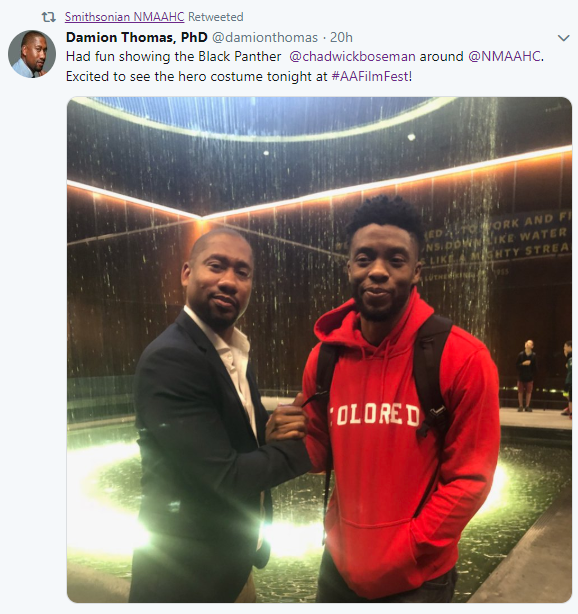 We were honored to have on display for the first time the Black Panther’s hero costume, worn by Chadwick Boseman. "Part of the Museum's mission is to be able to tell dynamic stories that really showcase strength and bravery and resilience and creativity and talent and fortitude. And I think that this costume, like so many objects in the museum, symbolizes that." Master Class instructors will share examples from their work as a basis for discussing best practices in their specialized fields. Attendees will have the opportunity to engage with instructors, to receive critical insights that directly relate to their individual projects. Exchanges are open forums to share ideas about film production and the archive of the moving image. Inventor, artist and computer scientist, John Henry Thompson leads Exchange entitled Code Switch: Technology and Video Art. 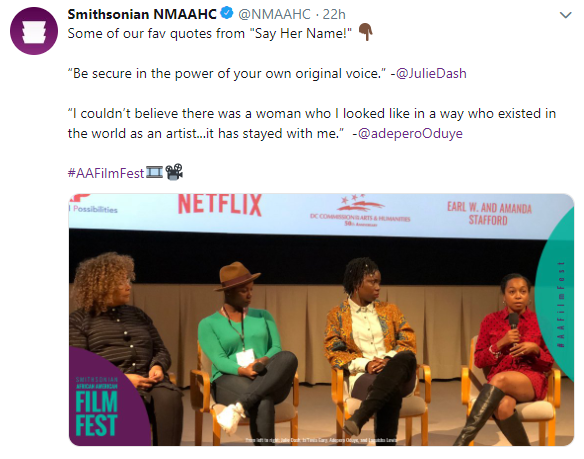 Recent social posts on the Smithsonian African American Film Festival. 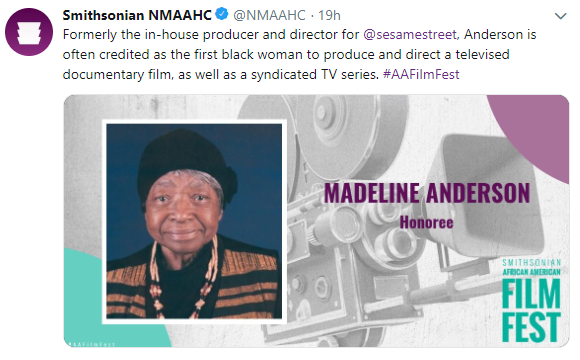 Through film, African Americans have fought against stereotypes and captured the beauty and complexity of the Black experience, our collective ingenuity, and undisputed resilience. Like the 40,000 objects in the Museum's permanent collection, the Film Festival will continue the tradition of great storytelling that is steeped in history, is culturally profound, and reveals the range of human spirit.